Marc has a passion for railways and painting. 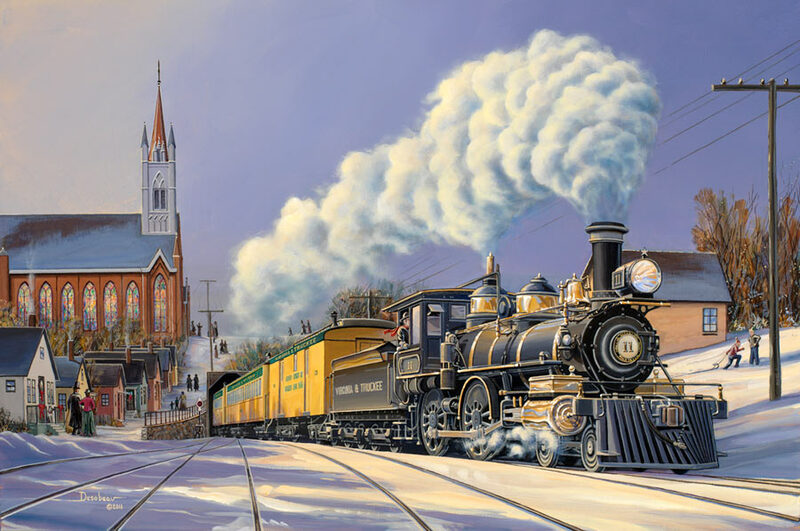 A lifetime of employment on the rails, combined with the desire to paint the subject authentically, has resulted in the production of his exceptional railway art. Marc believes, "As artists we paint that with which we are familiar with. 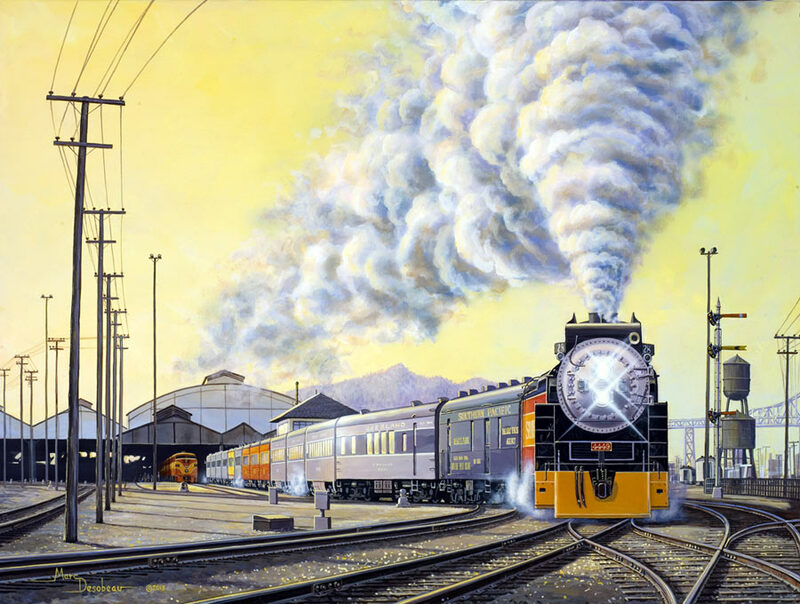 Railways are dynamic, creating a subject that is a natural calling to artists." 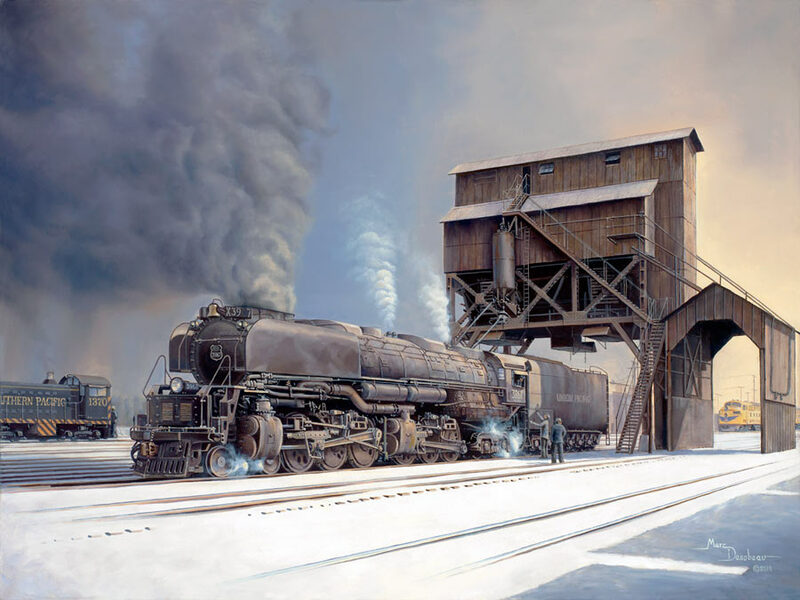 He searches for an artistic view of the industrial railroad image in an effort to share our fascination with trains. Coal burning Challenger locomotive number 3967 of the Union Pacific Railroad is steaming-up in the Ogden, Utah rail yard. We are watching a scene play out in the early 1950's as the domain of steam locomotives is being challenged by the new diesel-electric technology of the day. Eventually steam will give way to the progress and economy of diesel locomotives. However, on this day steam is still in command as this mighty engine is prepped for its day’s duties. The Virginia & Truckee Railroad Engine number 11, the "Reno", is arriving in Virginia City, Nevada with a load of holiday travelers. This classic American locomotive exemplifies pioneering railroads of the United States. The Virginia & Truckee Railroad was famous for its quality and pride. The line ran primarily from Reno, Nevada to Carson City and up to Virginia City. The people and supplies came in by rail and the wealth of the mineral industry traveled out by rail, all on the V & T Railway. 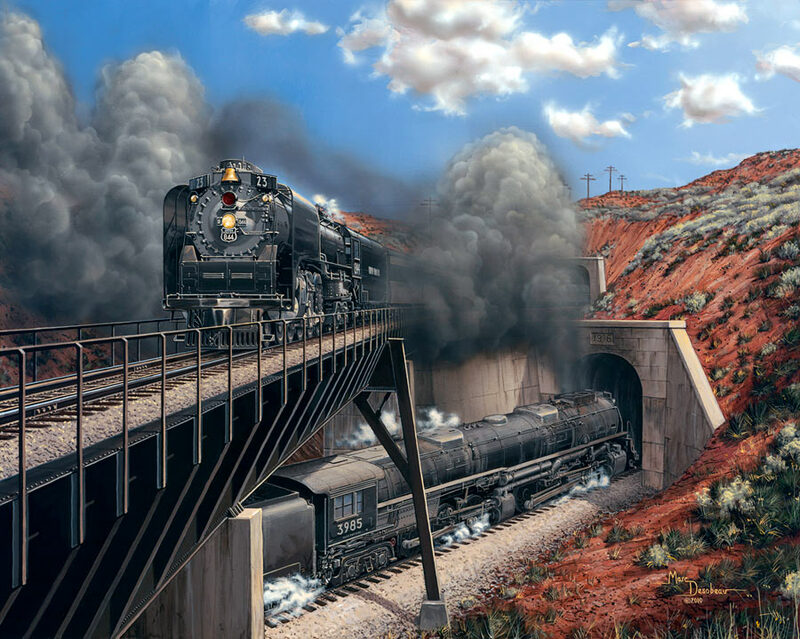 This painting celebrates two of the most famous steam engines in the world: Union Pacific Railroad's Challenger 3985 and Northern 844. Two giants of steam are passing each other at a location known as the "Curvo, Cross-over". This cross-over is located at the top end of the Echo Canyon in Utah. We are viewing the two engines around 1950 and serving the Union Pacific Railroad in regular service. It is early morning with the 844 leading train 23, the "Gold Coast" and the Challenger 3985 is working hard eastbound. Steam engines will eventually be replaces by diesel yet these engines will escape the scrapper’s torch and accountant's pencils and continue on as ambassadors of steam and the Union Pacific. 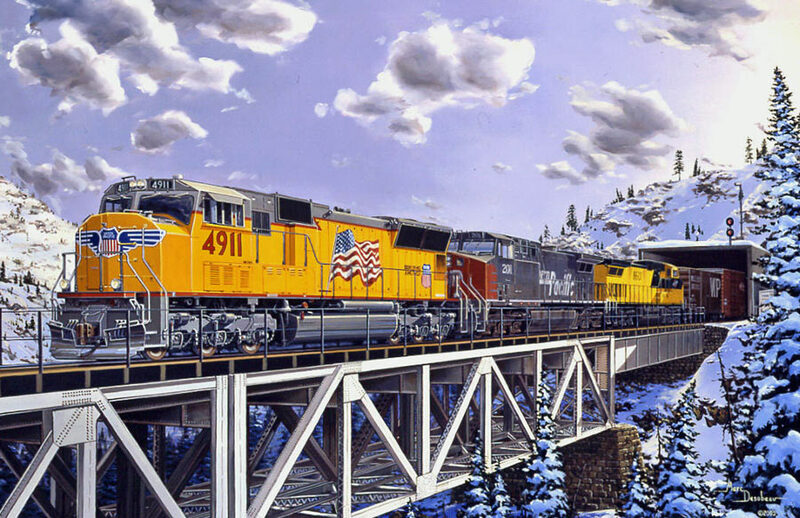 A wintry crossing of the rugged Sierra Nevada Mountains sees Union Pacific SD70M No.4911, accompanied by Southern Pacific AC4400CW No.201 and Chicago & Northwestern C44-9W No. 8601, ease west at dawn at Cisco, California, on the west side of Donner Pass. Today's Union Pacific is a railroad built through a series of mergers and acquisitions. This painting portrays some of the fallen flags that make up the "Overland Empire." Train number 28, the San Francisco Overland, is just getting under way from the Oakland Mole. This is the beginning of the eastbound trip for this train. The train will travel over half way across the United States and end its journey in Chicago, IL. It is around 1950 and steam locomotives are running their final trips as the diesel engines begin to take over. Leading the Overland today is Southern Pacific Railroad steam engine number 4449. This engine was initially designed to pull the famed Daylight trains up and down the California coast. The days of steam are numbered for these once famous engines and it would not be uncommon to find this type of engine in non-traditional rolls such as today on number 28. In the coming years this Daylight engine will elude the scrapper’s torch, find refuge for time on display, and then be restored to pull the famous Freedom Train. It will then go on to become one of the most famous excursion engines in steam locomotive history. This 'Highball' from the Oakland Mole is the beginning of the trip for the Overland and only a footnote for engine 4449. 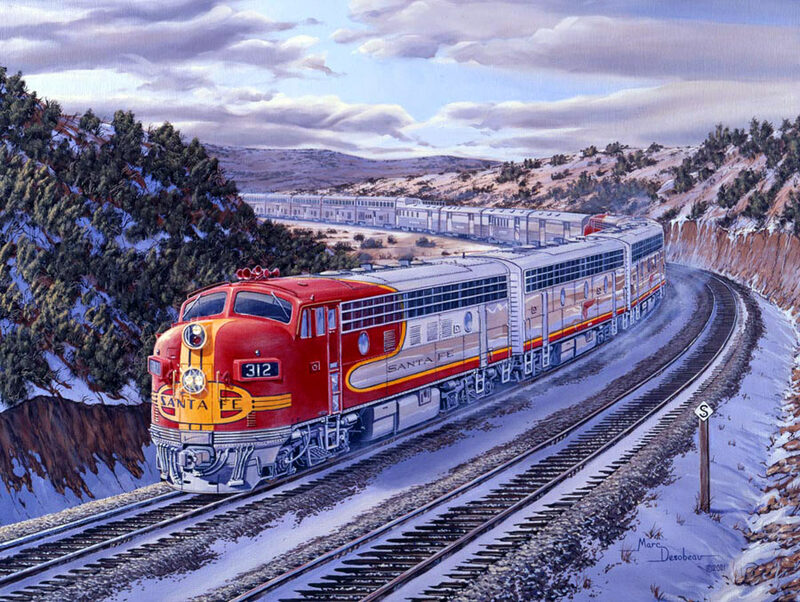 The image of classic passenger train travel is exemplified by the Atchison Topeka and Santa Fe Railway's red, yellow and silver design of its passenger train fleet. This image depicts the railways El Capitan/Chief passenger train traveling through the high desert country of New Mexico. Leading the train is an A-B-B-B-A set of General Motor’s F-7’s.